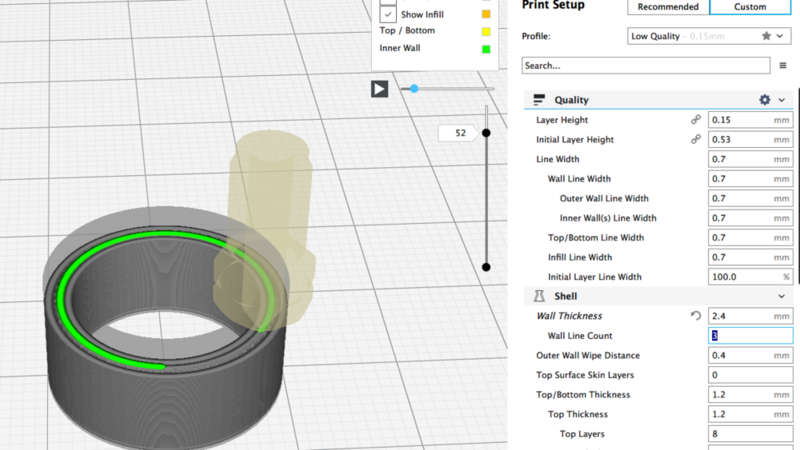 I see that each print in Cura is 0.7 mm - why not 0.8 mm since that is the nozzle width ? When setting the line width to 0.8 the inner wall gets choppy and some yellow tracks show up ?! The 0.7 width is 7/8 of the nozzle width. If you look at all the nozzle sizes, they are all based on that. I am not sure why, but that is the way that is. From what I see on the screenshots, you are asking for 3 walls. That is what you are getting as far as I see. Now, our resident volcano of knowledge @gr5 should be able to give you very good specifics. The 7/8 thing I suppose is that the quality comes out better if you are on the small side than the large side and nozzles aren't all perfect - some are smaller/bigger than nominal. But 0.8 works fine. In your case where your part is 2.4mm thick there is some small amount of floating point error. Try 0.79mm for the line width and it should work better. @gr5 Is that 7/8 UM brand nozzle kind of magic number? @amagro This seem to be related a specific brand 3D printer's firmware. It makes my stomach sick to learn this. I dunno why it would bother you so much. So many different ways of approaching the same problem with both firmware and hardware. This is why people should know their printers by asking questions such as the OP. At least I don't know the firmware of my 3D printer. 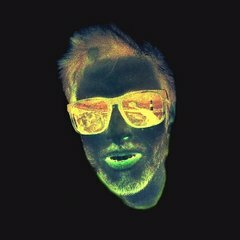 It is not Marlin but a closed source one. By blindly using whatever it defines or provides in slicing engine, we end up suffering from the sub optimal settings. Now I kind of understood why GPLv3 requires firmware need to open source as well. By blindly using whatever it defines or provides in slicing engine, we end up suffering from the sub optimal settings. And, that is why you need to know as much about your printer as possible and ask questions such as the OP did. Well,7/8 is absolutely a magic number from UM brand firmware test. I once wrote a BPMN file generator, where I need to lay down BPMN element in UI with coordinate. (It is a bad design in BPMN specs coupling logic and presentation). Anyway, the code I wrote has several magic number that can't be explained by science, but it makes the layout way much better. I strongly believe 7/8 is such thing as well. Note that 7/8 might not work well for non-UM brand 3D printer. But we incorporate that by UI logic. 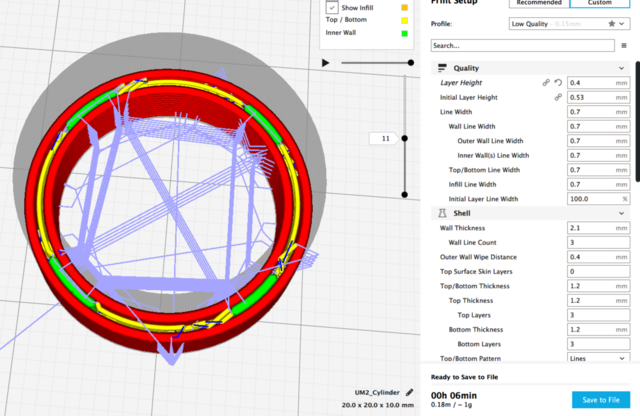 That scares me the conspiracy that Cura is dedicated or optimized only for UM. Hello ? Moderator speaking; we are drifting off topic! The OP has an Ultimaker 2+. 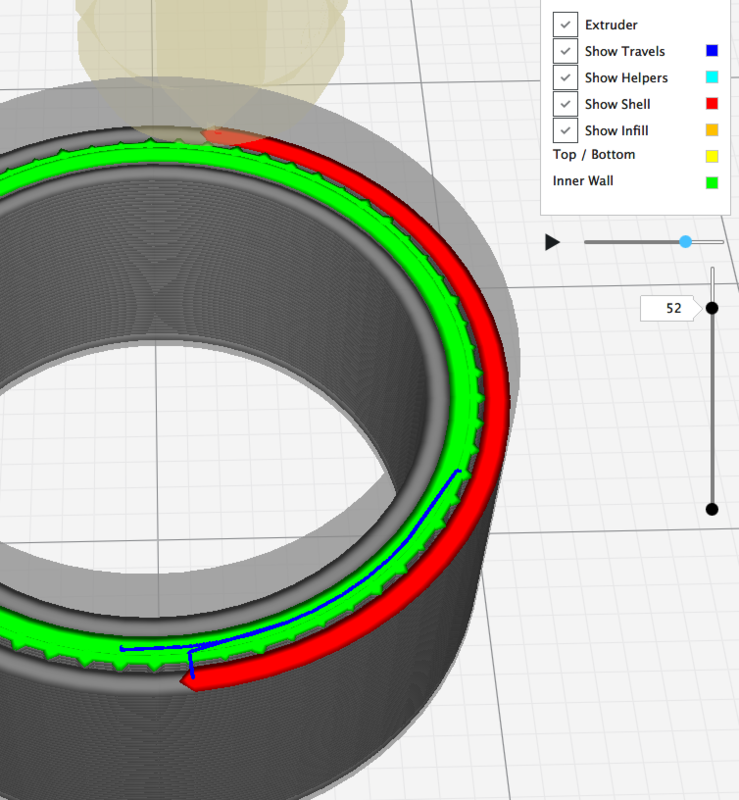 Feel free to debate about the function of 7/8 but let's not derail in Cura - 3D printer philosophies! Thank you! I personally have not heard of the 7/8 nozzle size thing. It does seem a good rule of thumb. I frequently tweak my line size up and more often down (as much as 3/4) to achieve solid walled parts such as the OP seems to be aiming for. 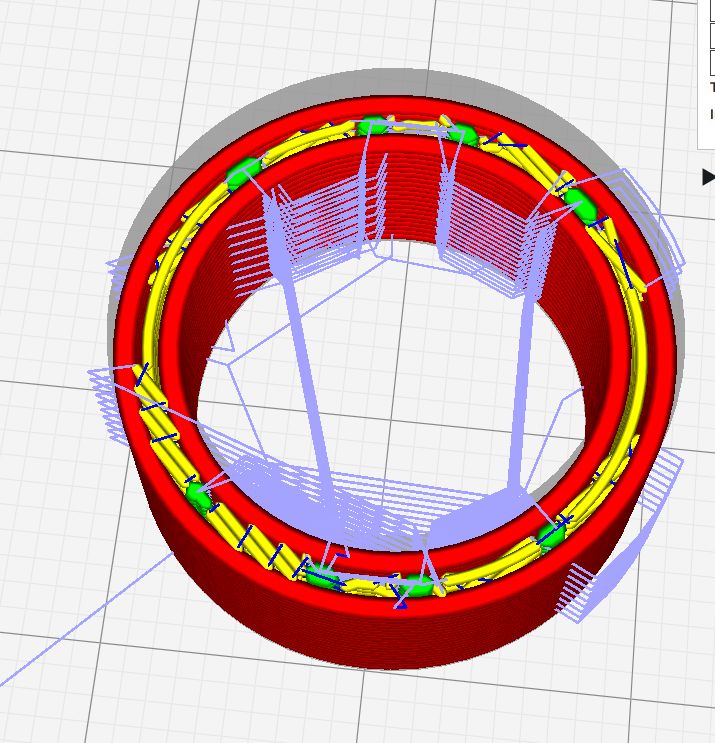 Very often, I intentionally design parts with walls in multiples of my nozzle size. The results shown in the OP's last image are hard to rationalize for the casual/new user. Worse, is the overall effect on exterior finish where the inner walls start and stop, seemingly at random locations. It can get a little frustrating when an altered line width works well for one area of a print and not for another area. Would it be possible for the slicer to ignore the floating point error to a limited degree to allow these type of part profiles to be printed with a whole number of walls? On occasions when I get the part shape to play nice with an even number of walls, the part quality is outstanding. Thank you for this. 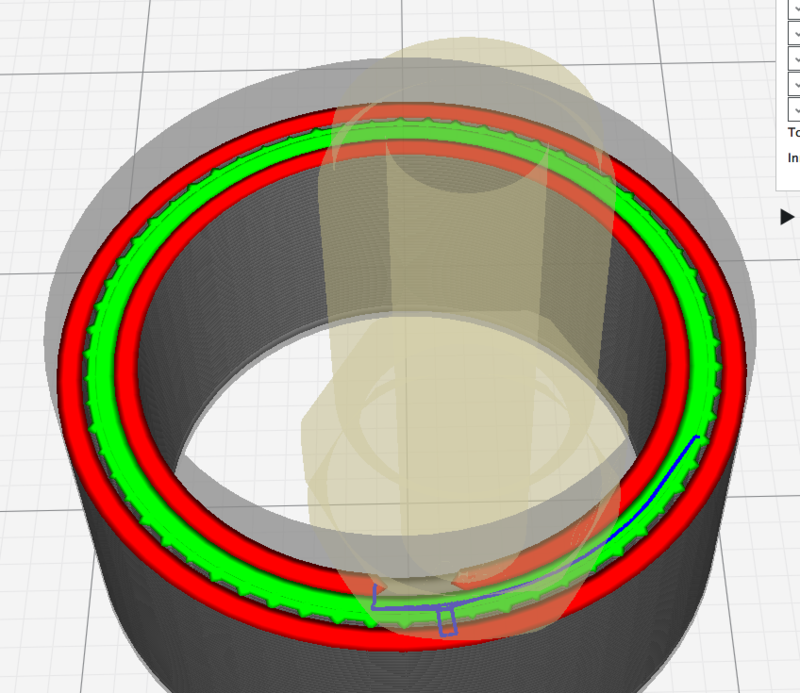 This indeed removes that extra green track - but interestingly Cura remains moving the print head. would it then not better to shell a design with the line width value than the nozzle value? I'm reading Cura 15.04 source code and try to get some understanding of how path generation works. I already figure out how to extract the closed polygon of the parts (a.k.a the islands) on each layer. Now I focus on how to get the starting point of each types like inset and infill in the parts. In 3.31 source code, the starting point of each layer is a mess. The z-seam setting determine this. If you are interested in discussing the starting point of path planning, I will open a separate thread. Just let me know. I now nothing about programming. I only try to understand how to direct Cura to get the most desirable results, help others in the same when possible and provide feedback to the programmers when I feel well enough informed to speak intelligently. Obviously, it is not only me who have this problem in latest Cura. Even in your UM brand printer, the z-seam option didn't yield a good print result, either. The feature that determines the starting point by shortest distance, sharpest corner and random should be removed completely. A better approach of avoiding z-seam needs to some further investigation. 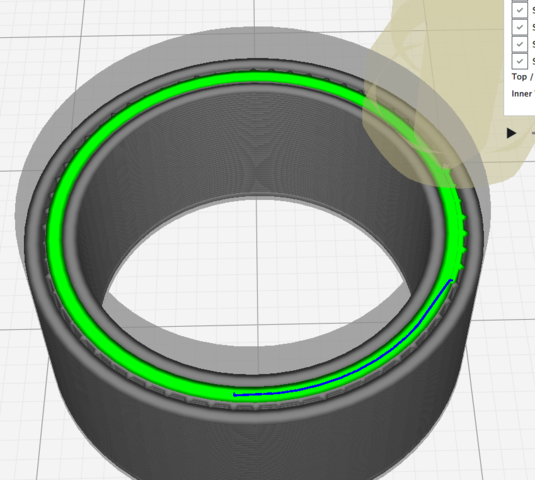 @cekuhnen - keep in mind that STL files contain only triangles (not circles) so the circles in your cylinder are broken up into line segments when exported from CAD to STL format. 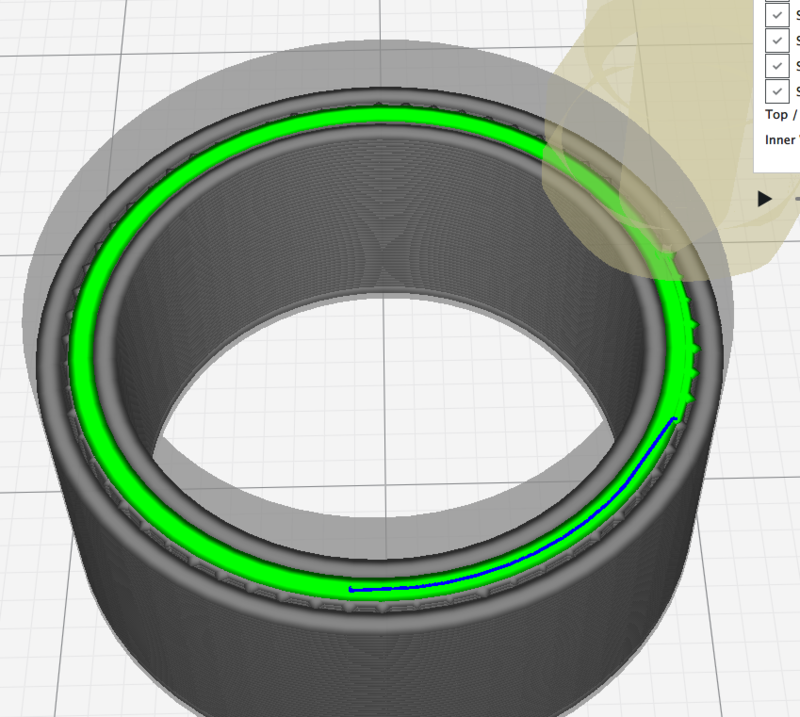 You can usually adjust how many line segments are outputted as part of the CAD settings. Too many line segments would be bad as Marlin doesn't like to print line segments much shorter than .2mm (a whole different discussion). But no matter how many line segments you have on the inner and outer surface of the cylinder the wall thickness will vary quite a bit around the 2.4mm you wanted. Oh I forgot - also cura insists on an even number of passes. So you can't divide the 2.4/3 and get 0.8. You have to divide by 2 or 4 or another even integer. So 2.4/4 would be .6mm line width. 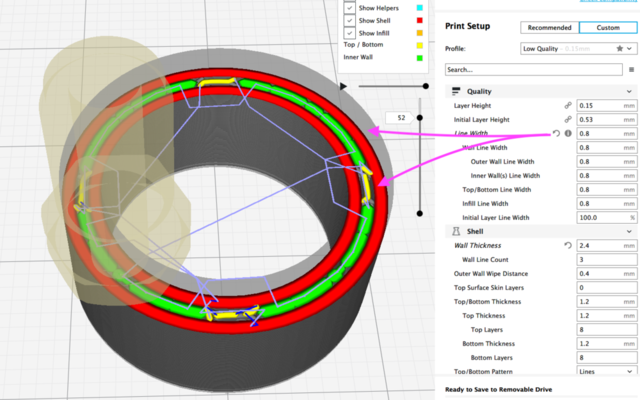 Try 0.6mm or 0.58mm and see how that looks in slice view! My understanding is that if you go to number of walls it overrides the metric measurement. That would be why it becomes greyed out and it does its own thing by counting walls. Yes? No? Thank you for all those additional side details !